Independent heating, Tv, HiFi, washing machine. Very luxurious apartment located in Via dei Cappellari a few steps from Campo dÃ¨ Fiori and Navona square in the heart of the historical centre. The fully restored apartment is located on the 1st floor inside an ancient building of the 1500. It is made up on two floors as it follows: 1Â° floor, fully equipped kitchen, dining room, very large hall, big bathroom with tub, double bedroom, closet, 2Â° floor, double bedroom, twin bedroom, bathroom with shower. It is provided with tv, hi-fi, washing machine. The high quality furniture, the floors made in cotto from Tuscany, the high ceilings and the prestigious soft-furnishings give the last touch to this very elegant apartment unique among our offers. This apartment is located on Via dei Cappellari, just behind the famous Campo dei Fiori and Piazza Navona. This is probably the most popular square among Roman young people, and one of the favourite sites for visitors. During the day, Campo dei Fiori is bursting with life and hustle thanks to its colourful market, in which you will find fresh vegetables and fruit, inexpensive clothes and souvenirs sold by easy-going locals that always enjoy a good chat, whether you are a new comer or you have already visited the Eternal City before. During the night, Campo dei Fiori changes its face completely, and the food stands give place to people from all over the world. The atmosphere will capture you in a way that you may find yourself not wanting to leave Rome any more! The apartment is also 300 metres away from Pantheon, and at a walking distance from the best historical sites in the capital and the popular Roman cafes, restaurants and shops. This stunning apartment is literally 100m from Campo Dei Fiori which is full of fabulous restaurants and bars, and a brilliant fruit and veg market during the day. The apartment is beautifully appointed in a typical Roman building and is full of character and light. It is really comfortable and a fabulous starting point for everything that this beautiful city has to offer. If we are ever lucky enough to return to the Eternal City, this would be our automatic choice for accommodation! Spacious appartment in a great location! Our family of seven were very easily accomodated here. The beds are super comfortable and cosy, the best we found in our seven week odyssey around Europe. Very quiet even though it is just off the bustling Campo dei Fiori. Appartement très bien place, mais peu fonctionnel: portes des sanitaires difficiles à fermer, débit des douches très faible avec une tuyauterie en piteux état. La personne chargée de nous remettre les clés nous a par ailleurs réclamé un supplément de 40 euros (taxe ?) qui ne fugurait pas dans les conditions initiales. Un peu déçu tout de même par rapport à nos Précédentes réservations sur ce site. Fabulous apartment! Great location - best part of the city to stay in (walking distance of nearly everything). The apartment setup was great (but watch your head in the 'kids' bedroom - those beams are low). We were five people - 3 adults, 2 kids, and we loved coming back to this place each night. Very quiet as it's on the inside of the building, so no road noise, despite it being close to a main road. Would definitely book it again and will recommend it to anyone I hear who's looking for a great, family apartment in Rome. Thanks! Fabulous apartment. We were three adults, two kids, and the setup was perfect for us (although, watch your head when walking down the hall into the room with twin beds - those beams are LOW). The location was exceptional - walking distance to everything, close to shops and food (and gelato for the kids). The apartment is very quiet, which is impressive considering how close it is to a major road - but being on the inside of the building really helps keep the noise down. We loved coming back to this place at the end of a long day. I would definitely recommend it to anyone looking for a great, central place in Rome, and would certainly stay there again myself. Thank you! 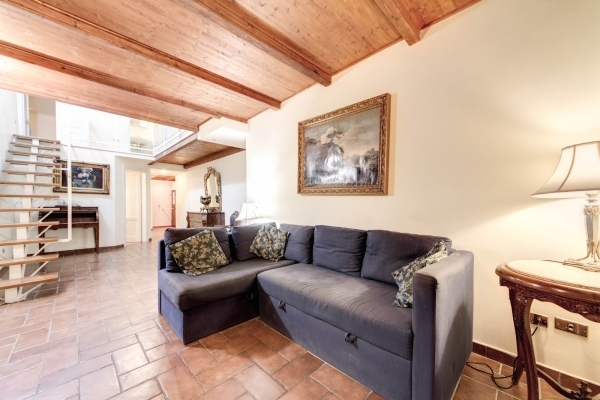 The location of this apartment was Excellent...it was walking distance to all of the major sites and an easy 2 minute stroll to Campa dei Fiori with it's cafes, market and evening excitement. The apartment itself was a adequate but the rooms on the upper floor had very low ceilings and if you are average height you may not be able to fully stand up. The location though made up for the 'short'comings!